This pumpkin might look juicy and bright but we're begging you not to take a bite! We get the craving. As soon as a chill hits the fall air, we're craving anything and everything pumpkin flavored too. We start the day with pumpkin flavored cereal. We pump our coffee with pumpkin creamer. We relax after lunch with a creamy pumpkin truffle. Dinner is complete with a savory pumpkin mole poured over a roasted chicken breast. And at the end of the day, you can bet we watch the sunset on colorful maple leaves while sipping on a cold pumpkin flavored beverages. But even we would not suggest biting into this juicy looking prop, it's just meant to get everyone else pumped up for pumpkin season. Cause it's about time other folks got on your level. 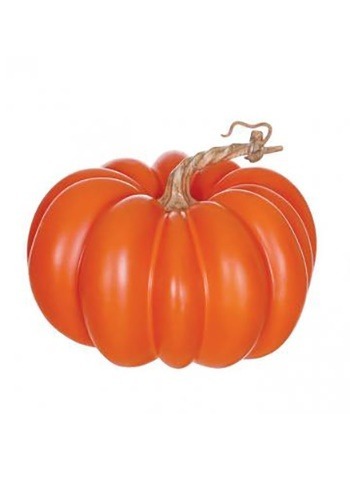 This lovely pumpkin stands out in both exterior and interior autumnal displays. A twisty stem adds a little bit of whimsy. Pair it with all sizes of gourds and pumpkins both real a prop and folks will know that you're all about that autumn feeling! There's no need to start fresh every fall, keep pumpkins that'll stay cuter than ever year after year in your decor arsenal. No need to put it away after Halloween, it'll be adorable for Thanksgiving centerpieces as well! You know that you and pumpkins are bonded for life, might as well commit!